Ultrabook are line of high-end subnotebook computers featuring reduced bulk without compromising battery life. Ultrabooks use low-power Intel Core processors, solid-state drives, and a unibody chassis to help meet these criteria. 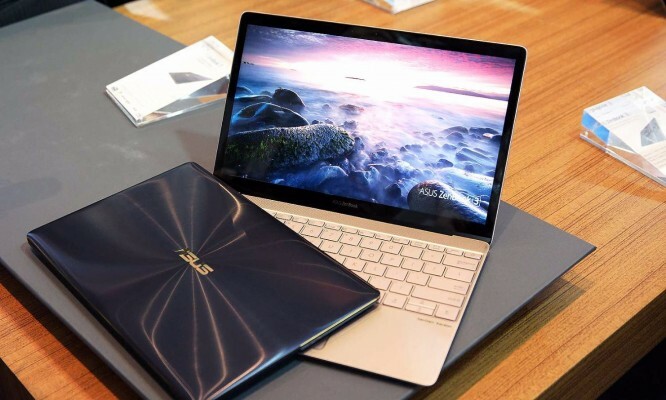 Due to their limited size, Ultrabooks typically omit common laptop features such as optical disc drives and Ethernetports. The name “Ultrabook” represents a portmanteau of the words “ultraportable” and “notebook”. Slim is in when business travelers need a powerful notebook that won’t weigh them down. The slim, sleek laptops in this class squeeze the essential elements of mainstream systems into smaller, more travel-friendly packages, but at a price. The design imperative for ultraslim laptops — a category of devices inspired by Apple’s 2008 bombshell, the MacBook Air — is to make the system as light and thin as possible without sacrificing much performance. Typically measuring around half an inch thick and weighing 2.5 lb., ultraslim systems lack the armor of mainstream laptops. That means they can be fragile, but many ultraslims include a three-year warranty, something that is worth hundreds of dollars. The typical design starts with 12.5- to 13.3-in. display that can show HD (1920 x 1080) or UHD (3840 x 2160) resolution. More times than not, this class of laptop has a touch-screen option available, but stops short of a fold-over convertible tablet design. Because their svelteness doesn’t leave much room for the battery pack, ultraslim systems need to cut down on power use to stretch battery life. One way they do so is by using midrange Intel Core i3, i5 and i7 processors instead of power-hungry top-of-the-line chips; some even go as far as using one of Intel’s low-voltage M5 CPUs. Despite this low-power regime, most can run for only around four or five hours on battery power. Happily, most ultraslims have small and light AC adapters that aren’t too burdensome to carry around, and some have a fast-charge feature that adds a couple hours of battery life with minimal charging time. Because these systems will spend lots of time remotely connected to the Internet and the company’s server infrastructure, ultraslims take security seriously. In Windows machines, expect to see TPM, an Intel processor with vPro manageability extensions, and a fingerprint scanner or a webcam capable of using Windows Hello’s facial recognition. Some include a security cable lock slot as well. Other components typically include 8GB to 16GB of RAM, integrated Intel graphics and an SSD with a capacity ranging from 128GB to 512GB. These systems are aimed at executives, so many include luxuries such as high-end audio systems and backlit keyboards. One thing you likely won’t find: an optical drive. Ports are typically a step up from a tablet’s minimalist offerings but far sparser than those found on mainstream systems. Most ultraslims include a traditional USB 3.0 and a USB-C port, and sometimes a dedicated HDMI connection for a display or projector. Some have an audio jack but most eschew an Ethernet port, instead relying on 802.11ac Wi-Fi for internet connectivity. There’s frequently an optional docking station available that expands the device’s connection possibilities, often with high-speed Thunderbolt 3 connections and the ability to drive several monitors at once for a desktop array when the employee is office-bound. These razor-thin systems are the ones we lust after. Their high price tags, though, make them applicable only for the most mobile — or most high-profile — members of an organization. Target audience: The mobile power-elite. Screen size (diagonal): 12.5 to 13.3 in. Weight: 2.1 to 2.9 lb. Buying tip: Get a system that has a dock for when workers are in the office.